In KS and ND, kochia has developed cross-resistance to dicamba and fluroxypyr. Many growers have started planting soybean varieties with dicamba tolerance, but unfortunately, dicamba isn’t a silver bullet when it comes to weed control. Scientists have confirmed kochia resistance to dicamba and fluroxypyr in KS and ND, so you’ll need to take actions to prevent further cross-resistance. Apply corn, soybean and wheat herbicides with multiple effective sites of action (SOAs). Plant crops with high populations and narrow rows into clean fields to reduce weed pressure. 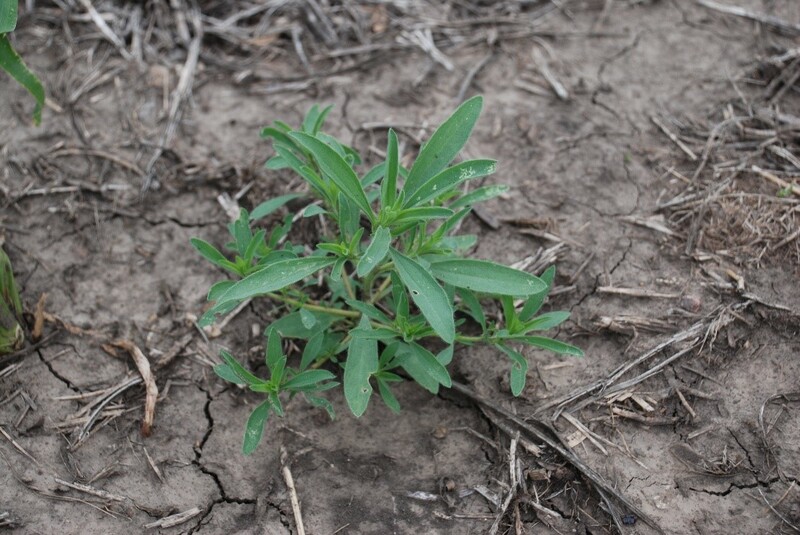 Eliminate any kochia herbicide escapes with targeted tillage or resprays before reproduction. Irrigate, apply fertilizer and spread crop residue to reduce weed seed movement. Thoroughly clean equipment before moving from one field to another to avoid spreading resistant seeds to new fields. Remove any escaped kochia seeds in postharvest crop stubble. Clear kochia populations at field borders, fences, roads and other non-crop areas. Rotate crops and considering planting cover crops to diversify management tactics. Corn: A 2-pass system of Acuron® or Acuron Flexi corn herbicide. Acuron has 3 effective sites of action (Groups 5, 15 and 27) and Acuron Flexi has 2 (Groups 15 and 27). Both Acuron and Acuron Flexi contain bicyclopyrone, which complements the other active ingredients in the premix to deliver broader, more consistent management of tough weeds other products are missing. In a 2-pass system, Halex® GT herbicide plus either an atrazine or dicamba product may be used as the post application. Applying Halex GT post-emergence following a foundation rate of Acuron or Acuron Flexi adds another site of action (Group 9). Soybeans: For excellent residual control in soybeans, BroadAxe®XC manages beyond the basics, delivering 2 effective sites of action (Groups 14 and 15). For a full-season weed management program, BroadAxe XC can be followed by an overlapping glyphosate herbicide application. Wheat: We recommend a post-emergence application of Talinor® cereals herbicide (Groups 6 and 27), as kochia has not shown resistance to either site of action. As you outline 2019 herbicide options, establish a full-season herbicide program that will keep your fields clean next year and beyond. Our Resistance Fighter® program provides local recommendations for efficiently managing weeds and weed resistance in your area.